Unpaid Medical Bills Can Hurt Your Credit. Take Control. Can medical bills affect your credit? The short answer is yes, if you don't pay them. The U.S. spends more on health care per capita than any other country, according to a report by the Peterson-Kaiser Health System Tracker. So, it's not surprising that in 2014, the Consumer Financial Protection Bureau found that as many as 43 million people had overdue medical bills in their credit reports. Getting behind on medical debt can endanger your financial health, especially if the late payments show up on your credit report. Similar to credit card debt, unpaid medical bills can cause a good credit score to drop fast, and it’s not always easy to get it back. If you allow a medical bill to go unpaid, the medical provider can sell it to a collection agency. The collection agency will typically report the unpaid bills to the credit reporting agencies as a collections account. A collection account can have a significantly negative impact on your credit score, primarily because the most important factor in your credit score is your payment history. Once added to your report, a collection account can remain for seven years. You won’t necessarily see the account show on your credit report right away, though. Some good news is that in 2017, the three national credit bureaus, Experian, Equifax and TransUnion, agreed to give consumers a waiting period of 180 days before adding an unpaid medical debt to their credit reports. In other words, you have six months to pay your bill or resolve insurance issues before a medical bill impacts your credit. If medical collections show up on your credit report, there’s no exact measure for how much damage it will do. For example, in FICO’s most recent credit scoring model, FICO 9, medical collections debt doesn’t hurt your FICO score as much as other collections debts. But lenders or other consumers of the credit bureaus' reports aren’t required to update to use new credit scoring models, and many of them still use earlier models that treat medical and non-medical debts the same. As such, it’s essential that you do everything you can to pay your medical bills before the 180-day waiting period ends. Isn’t This a HIPAA Violation? The Health Insurance Portability and Accountability Act (HIPAA) generally bars medical providers from sharing patient information with a third party. However, medical providers are allowed to use patient information to collect payment for treatment, and using a collection agency is considered part of that process. If the practice shared details about or the purpose of your treatment, that might be considered a HIPAA violation. Some states may have more specific rules around information disclosure as illustrated in this example from the California Dental Association. What if I’m Waiting for the Insurance Company to Pay? The 180-day waiting period is designed to give you and your insurance company enough time to pay the bill. So, if there’s a dispute with your insurance company and it still hasn’t made a payment, the medical collection account can still show up on your credit report. Fortunately, the new law that requires the 180-day waiting period also requires the removal of medical collections if they’re paid by the health insurance company. That said, it may not be worth having your credit score drop even for a short period while you’re waiting for your insurance company to cough up. So, consider finding other ways to pay your medical bill and then requesting a reimbursement from the health insurance company when the insurer approves the claim. While there’s not much you can do about a legitimate medical collection account on your credit report, a credit reporting agency or debt collection agency sometimes makes a mistake. If you notice unpaid medical expenses on your credit report that have been added in error, contact to the credit bureau directly to dispute it. You can typically complete the dispute process online or over the phone. If your credit report lists a phone number for the collection agency, consider calling that agency to dispute the debt as well. Just be sure you don’t agree to make any payments or assume the debt. Not only will that add to your overall debt burden, but it may reset the clock on the statute of limitations. 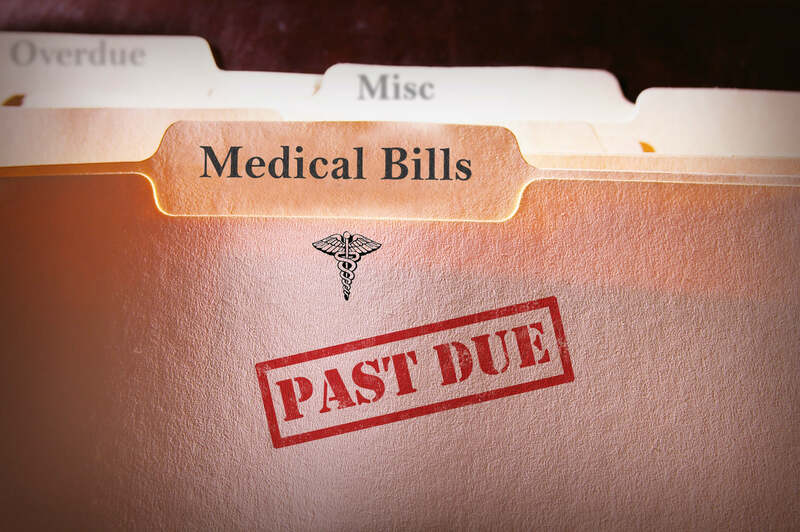 It's important to know there are limits on how long a creditor or debt collector can take legal action against you for medical expenses you haven't paid. Those limits vary from state to state and by type of debt (see The Balance for a nice guide) so it's best to find a lawyer or credit counselor in your state to advise you. The statute of limitation doesn't mean the agency can't call you for that debt in collections, but it does mean the agency doesn't have forever to be able to take you to court for it. If you give in to the pressure of the collections agency and make a payment, the clock starts over on the statute of limitations. Medical collections remain in your credit report for seven years like other collections. So lenders may still see the debt when reviewing your credit report. Whether or not you’re waiting for your insurance company to take care of your medical bill, it’s best to avoid the possibility of having it end up on your credit report. Here are five options you have to achieve your goal. Payment plan: Medical providers often offer payment plans to their patients. Some don’t even charge interest, making it more likely you can addord to pay it back. Medical credit cards: Companies like CareCredit offer small loans or credit card accounts to pay your medical bill. This option is typically available even if you have bad credit. 0% APR credit cards: If you have good or excellent credit, you could qualify for a credit card that offers an introductory 0% APR credit card. That way, you can pay off your medical bill over time without any interest. Just keep the promotional period in mind; interest rates typically spike once it’s over. Personal loan: Personal loans can typically be used for anything, including paying medical bills. If you have bad credit, though, you may end up with a high interest rate. Loan from a family member or friend: You may have a trusted family member or friend who would be willing to lend you the amount you need. In this case, remember that making late payments or defaulting could damage your relationship. You can also consider asking the original creditor (hospital, doctor, etc.) if you can negotiate to reduce the bill. For example, ask if they offer discounts if you pay in cash, and check for potential billing errors. As you do all of these things early on, it will be easier to avoid the problems that come with having an unpaid medical debt added to your credit report. And if you don't feel confident you can do this on your own, consider credit counseling. There are many non-profit credit counselors certified by the National Foundation for Credit Counseling and the Federal Trade Commission has tips for choosing a good credit counselor. Ben Luthi is a personal finance writer, who has a degree in finance and was previously a staff writer for NerdWallet and Student Loan Hero.